Not drawn to scale. The illustration shows the Mars-sized Kepler 138b in the foreground, with blurs symbolizing how 138b’s gravity affects the orbits of its neighbors. There may be “no place like home” in The Wizard Of Oz, but in the Milky Way, there could be billions of planets that are like Earth. But really big planets are a lot easier to spot than Earth-size planets, so our view of what’s out there is skewed. 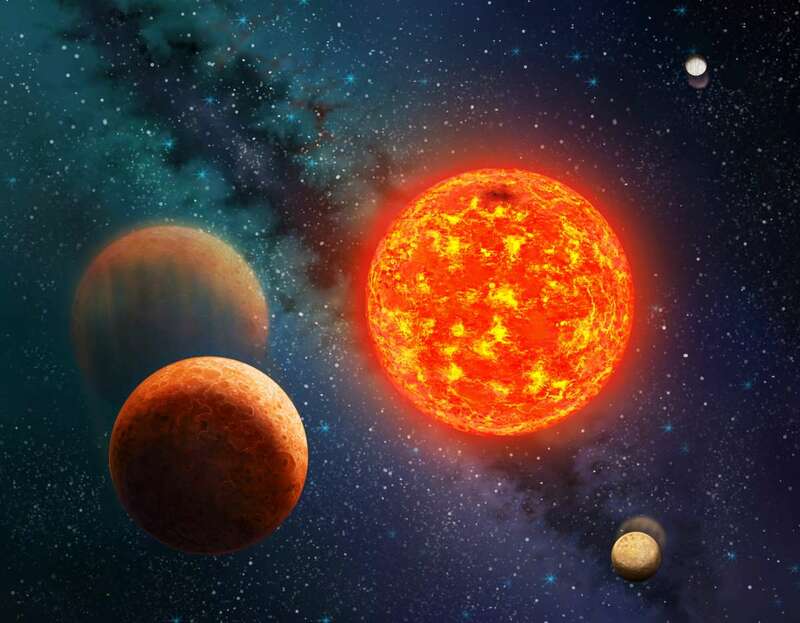 “Planets smaller than Earth may well be the most common type of exoplanets, but since they are much harder to detect, there are not many we can study in detail,” Daniel Jontof-Hutter, an astronomer at Pennsylvania State University, told Popular Science. Now, for the first time, Jontof-Hutter’s team has managed to measure the size and mass of a planet that’s actually 10 times smaller than Earth. Up until now, the smallest planet we’ve weighed was almost twice as massive as our home planet. Two hundred light-years away, Kepler 138b is a small, baking hot planet. Scientists first spotted it by watching it eclipse its star, and the tiny shadow it created revealed that it was about the size of Mars. Now, thanks to new mass measurements, with which researchers calculates Kepler 138b’s density, we know the planet is not gassy or icy or metallic, but rocky like our own. The typical way of measuring a planet’s mass is by seeing how much the planet’s gravity makes its star wobble. But since smaller planets have less gravity, the star wobbles they induce are minuscule. So to get the mass of Kepler 138b, Jontof-Hutter’s team instead measured how the planet’s gravity affected the orbits of its neighboring planets. “Each planet accelerates and slows down ever so slightly because of the gravity of its neighbors,” explains Jontof-Hutter. So the gravity bump from Kepler 138b changed the length of its neighbors’ orbits ever so slightly. The change in time revealed that Kepler 138b weighs in at about 7 percent of Earth’s mass. This method of measuring mass is not new, but it only works in certain star systems—like Kepler 138, where multiple planets are orbiting close to their sun, and where there’s lots and lots of data to analyze and compare. The fact that scientists have measured the mass of this extremely distant, tiny planet is amazing. If scientists can study more of these Earth-size or smaller exoplanets, it will tell us how unique (or not) our solar system is. And that has implications for our chances of finding life elsewhere in the galaxy. 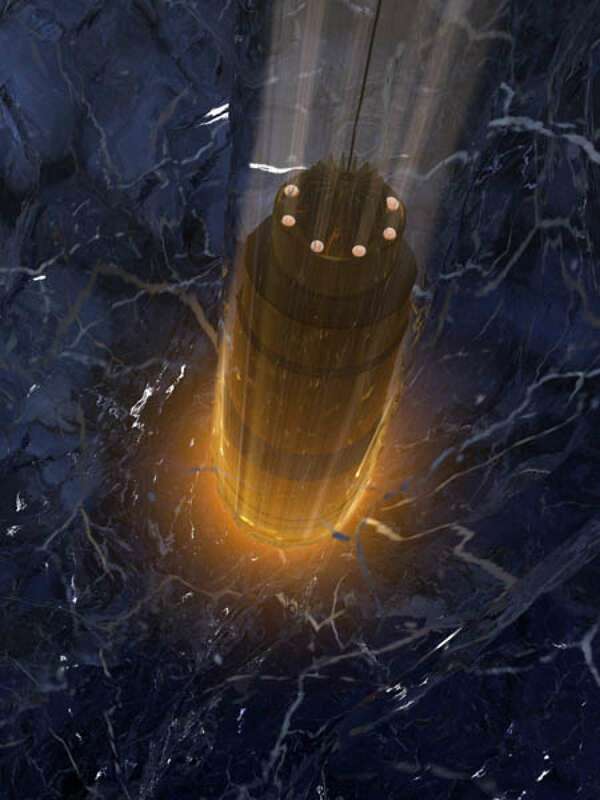 What has lasers, a torpedo-shaped body, and is capable of tunneling where no one has tunneled before? VALKYRIE, one of the ‘cryobots’ that is paving the way towards exploring icy moons like Europa in the future. Jupiter’s moon Europa is considered a prime candidate for extraterrestrial life with a saltwater ocean buried under a thick crust of ice. Getting to the water from the surface is a difficult task, but some roboticists think they’ve found the answer in robots designed to function well in the cold–cryobots, for short. As Astrobiology Magazine reports, one group testing cryobots is Stone Aerospace, which developed the VALKYRIE (Very deep Autonomous Laser-powered Kilowatt-class Yo-yoing Robotic Ice Explorer) a few years ago and has been testing it ever since, hoping that one day it will join a Europa mission. VALKYRIE (not to be confused with another NASA robot named Valkyrie) cuts through the ice with lasers, creating stable tunnels that she can slide through. This summer, VALKYRIE will be tested again at the Matanuska glacier in Alaska, where it successfully completed tests last summer. This summer it will be testing an instrument that can hunt for microbes beneath the glacier’s surface, a technology that would be vitally important to finding life on Europa. The first mission to Europa will likely be the Europa Clipper, launching sometime in the 2020s. Instead of landing on the surface, or drilling underneath the ice, it will stay aloft, making excursions into the moon’s atmosphere. There will still be plenty of cool tech onboard to search for signs of life. And who knows, the mission after that might be equipped with a cryobot, which can dig a little deeper into Europa’s surface. VALKYRIE will have some competition though. Stone Aerospace is also testing ARTEMIS, a robot that will be tested in Antarctica this fall, joining a growing crowd of autonomous vehicles mapping that continent’s sea ice, and other teams are working on lamprey-like soft robots that could explore Europa’s oceans. If you love stargazing, there’s a date you need to mark on your calendar. It’s June. That’s right, the whole month! Throughout the month of June 2015, the two brightest planets in the night sky, Venus and Jupiter, are going to converge for a jaw-dropping close encounter. You don’t want to miss any of the action. Venus and Jupiter are converging for a must-see close encounter at the end of June. It could be the best backyard sky show of 2015. When the sun goes down, step outside and look west. You don’t have to wait until the sky fades to black. Venus and Jupiter are so bright, you can see then shining through the twilight. In fact, some people say the planets are especially beautiful when they are surrounded by the cobalt hue of the early evening sky–so don’t wait. During the first two weeks of June, Venus and Jupiter converge until they are only about 10 degrees apart. For reference, this means they would just fit together inside the bowl of the Big Dipper. You could hide them both, simultaneously, behind the palm of your outstretched hand. This is pretty close, but by the end of the month this distance will shrink by a factor of 30. In fact, every night in June, the separation between Venus and Jupiter will visibly shrink. One good night to check on their progress is June 12th. After dark, scan the sky around Venus with binoculars. You can see the Beehive Star cluster! Venus will be passing right by it. On June 18th, Venus and Jupiter will be only 6 degrees apart. Now you can hide the two behind just two or three of your fingers with your arm outstretched. On June 19th, something exciting happens: the crescent Moon joins the show. On that evening, the Moon, Venus and Jupiter will form a bright isosceles triangle in the sunset sky. Isosceles means that two sides of the triangle are the same length. This is how most sky watchers in North America will see it. One night later, on June 20th, the vertices rearrange themselves, forming yet another isosceles triangle. Never has a geometry lesson been so beautiful. The nights of June 19th and 20th, by the way, are good nights to look through a telescope. Even a small telescope will show you the fat crescent phase of Venus, the cloudtops and largest moons of Jupiter, and the rugged terrain of Earth’s own Moon. Swing your optics around the triangle for a fast-paced heavenly show. The main event occurs on June 30th. On that night, Venus and Jupiter will be a jaw-dropping 1/3rd of a degree apart. That’s less than the diameter of a full Moon. You’ll be able to hide the pair not just behind the palm of your outstretched hand, but behind your little pinky finger. Wow. Here’s hoping you spend a lot of time under the stars and planets in June. The three-person crew of Expedition 43 has safely touched down in Kazakhstan. Expedition 43 was helmed by NASA’s Terry Virts, who was joined by Flight Engineers Samantha Cristoforetti (European Space Agency) and Anton Shkaplerov (Roscosmos). Their return marks the end of a 199-day sojourn aboard the International Space Station, during which the crew took part in hundreds of scientific investigations. One of the most notable investigations was the launch of the One Year Mission, a NASA study that aims to better understand the long-term effects of spaceflight on the human body. The crew also investigated new synthetic muscle technologies, infectious diseases and bone loss. 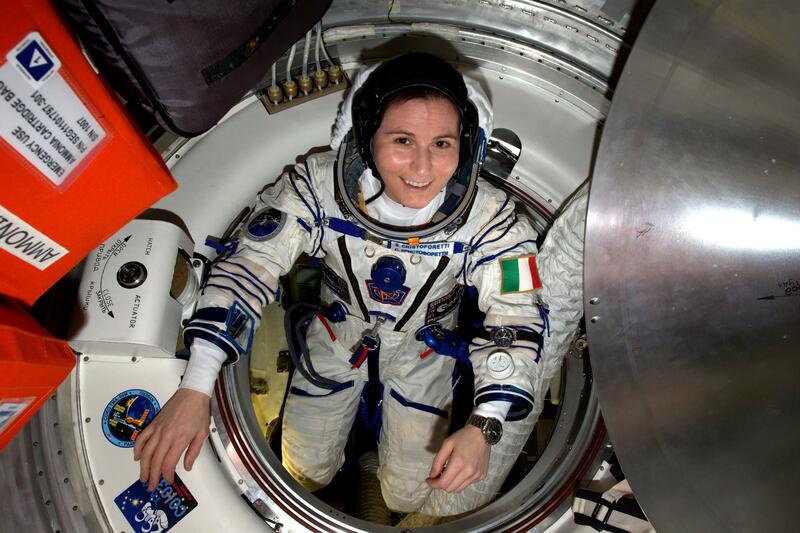 Upon completion of her mission, Cristoforetti set a new record for single mission duration by a female astronaut, a distinction previously claimed by NASA’s Suni Williams. Presently, the Expedition 44 crew is in charge of the International Space Station. Russia’s Gennady Padalka is in command, and is joined by NASA’s Scott Kelly and Roscosmos’ Mikhail Kornienko. They will be joined by NASA’s Kjell Lindgren, Roscosmos’ Oleg Kononenko and Japan Aerospace Exploration Agency astronaut Kimiya Yui in late July. Artist rendition of WASP-142b (on the left), as seen from a hypothetical moon. A 15-yr-old schoolboy has discovered a new planet orbiting a star 1000 light years away in our galaxy. Tom Wagg was doing work-experience at Keele University when he spotted the planet by finding a tiny dip in the light of a star as a planet passed in front of it. “I’m hugely excited to have a found a new planet, and I’m very impressed that we can find them so far away”, says Tom, now aged 17. It has taken two years of further observations to prove that Tom’s discovery really is a planet. Tom found the planet by looking at data collected by the WASP (Wide Angle Search for Planets) project, which surveys the night skies monitoring millions of stars to look for the tell-tale tiny dips (transits) caused by planets passing in front of their host star. Tom’s planet has been given the catalogue number WASP-142b, being the 142nd discovery by the WASP collaboration. It is in the Southern constellation of Hydra. While astronomers worldwide have now found over 1000 extra-solar planets, Tom is possibly the youngest ever to have done so. “The WASP software was impressive, enabling me to search through hundreds of different stars, looking for ones that have a planet”, says Tom. The planet is the same size as Jupiter, but orbits its star in only two days. With such a short orbital period the transits occur frequently, making such planets much easier to find. While the planet is much too far away to see directly, an artist’s impression shows how it might look. The hemisphere facing the star is hot, blasted by the irradiation from the star, while the other hemisphere is much cooler. Tom, a pupil at Newcastle-under-Lyme School who has always been keen on science, asked for the work-experience week after learning that Keele University had a research group studying extra-solar planets. “Tom is keen to learn about science, so it was easy to train him to look for planets”, says Professor Coel Hellier, who leads the WASP project at Keele. Tom has since achieved 12 GCSEs, all at A*, and wants to study physics at university. The planet is one of a class of “hot Jupiter” planets, which — unlike the planets in our own Solar System — have very tight orbits close to their stars. They are thought to have migrated inwards through interactions with another planet. Thus it is likely that Tom’s planet is not the only planet orbiting that star. The planet does not yet have a name, though the International Astronomical Union has started a contest to name extra-solar planets. Tom is looking forward to making a suggestion for his planet. The WASP collaboration (Wide Angle Search for Planets) is the UK’s leading team discovering planets, having been recognised with a Group Achievement Award by the Royal Astronomical Society. Keele University operates WASP-South, an array of cameras which surveys the Southern Hemisphere sky each clear night. The WASP consortium also involves scientists from the Universities of Warwick, Cambridge and St. Andrews, and collaborates with scientists in Switzerland, France and Belgium. After Tom found the candidate planet, it was studied by astronomers at the University of Geneva and the University of Liege, to prove that it has the right size and mass to be a planet. A paper reporting an analysis of WASP-142b is being prepared. Thirsty moon settlers might enjoy a drink with the help of the sun. At sunrise, its warmth drives water molecules from the lunar soil – ripe for harvest with the right know-how. Since 2009, several lunar probes have found indirect evidence of abundant water on the moon by looking for hydrogen, since the element is present in water molecules. But no one wants the hassle of mining through the dusty surface to drink it. The moon’s gravity is so low and its atmosphere so tenuous that water molecules in the ground turn directly to vapour when heated. Free to bounce around at near the speed of sound, they condense again when they get cold, piling up as frost where temperatures are low. The greatest build-up is at the dawn terminator: the region where the sun is just rising. A lunar “day” is a full month long, so the water molecules have a lot of time to accumulate. Tim Livengood of NASA’s Goddard Space Flight Center in Greenbelt, Maryland wondered how much drinkable water you could collect if you set up a solar-powered distillery to catch the morning frost. “When the sun rises – actually, when the surface rotates into sunlight – we just drop a clear plastic dome over our collecting surface and let the sun turn it back into vapour,” Livengood says. The vapour then frosts up the inside of the surface, where it can be harvested. Using hydrogen measurements taken between 2009 and 2011 by NASA’sLunar Reconnaissance Orbiter (LRO), Livengood calculated that the frost build-up at the terminator would be just under a fifth of a millimetre thick – enough to yield about 190 millilitres of water per square metre per lunar day, with a suitable set-up. That could include a small sun-tracking shade to cast a permanent shadow, mimicking the terminator and allowing astronauts to collect frost all day long. But Andrew Jordan of the University of New Hampshire in Durham thinks water isn’t the only possible explanation for the hydrogen peaks LRO observed in some regions. “I would expect the amount of hydrogen to increase with depth,” he says. However, since the LRO observations are in line with hydrogen decreasing with depth, he is inclined to think something else is going on. It could be that hydrogen is leaking from localised sources, he says. Livengood says it’s possible he is misinterpreting the LRO data, but he’s confident there is plenty of hydrogen at the surface, where previously scientists thought there was none. “There is something going on here that was unanticipated, which means there is something new for us to learn about the world,” he says. An impact crater containing deposits of glass could hold clues for understanding life on Mars. Discovered by NASA’s Mars Reconnaissance Orbiter, the glass is believed to be the byproduct of the intense heat from a violent impact. Glass in and of itself isn’t necessarily indicative of life — the surprise lies potentially lies within: in 2014, researchers discovered evidence of organic plant life entombed in glass found in Argentina from millions of years ago. “Glasses are potentially important for preserving biosignatures,” according to Brown University researcher Kevin Cannon. 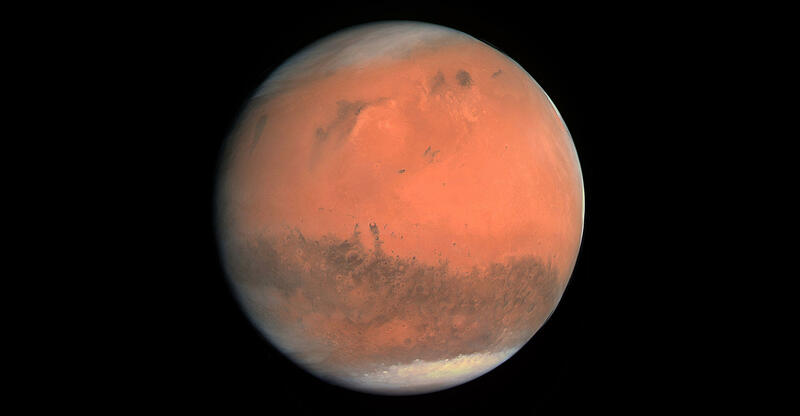 Researchers hope that the same could hold true on Mars: that the glass deposits hold important biosignatures of ancient Martian life. Conveniently, one of the glass-containing craters is located within close proximity to the Nili Fossae trough, which has already been identified as a possible landing site for NASA’s Mars 2020 rover mission. The mission aims to collect soil and rock samples that could potentially be returned to Earth and analyzed. Students from Sabancı Univesity Amateur Astronomy Society volunteered to help translating for “Bulutsu” which is an initiative to translate daily entries of “Astronomy Picture of the Day” (APOD) from English to Turkish. APOD is a NASA website which publishes daily astronomical photos and explanations below them. If you could put Saturn in an enormous bathtub, it will float the planet has less density than water. Jupiter is heavier than all other planets put together. Neutron stars are very dense. A tablespoon of neutron star would weigh about ten billion tones. The future of the Universe may depend on how much dark matter there is. If there is too much, its gravity will eventually stop the Universe’s expansion – and make it shrink again. The first known practical telescopes were invented in the Netherlands at the beginning of the 17th century, using glass lenses. They found use in terrestrial applications and astronomy. Within a few decades, the reflecting telescope was invented, which used mirrors. In the 20th century many new types of telescopes were invented, including radio telescopes in the 1930s and infrared telescopes in the 1960s. The word telescope now refers to a wide range of instruments detecting different regions of the electromagnetic spectrum, and in some cases other types of detectors. Refracting telescopes are the most common form of the telescope – a long, thin tube where light passes in a straight line from the front objective lens directly to the eyepiece at the opposite end of the tube. * Easy to use and consistent due to the simplicity of design. * Good-quality refractors cost more per inch of aperture than any other kind of telescope. Reflecting telescopes use a huge concave parabolic mirror instead of a lens to gather and focus the light to a flat secondary mirror that in turn reflects the image out of an opening at the side of the main tube. You look through an eyepiece on the side of the tube up near the top. * Excellent for faint deep sky objects such as remote galaxies, nebulae and star clusters because of their larger apertures for light gathering. Catadioptric telescopes use a combination of mirrors and lenses to fold the optics and form an image. Catadioptrics are the most popular type of instrument, with the most modern design, marketed throughout the world in 3 ” and larger apertures. There are two popular designs, the Schmidt-Cassegrain and the Maksutov-Cassegrain. In the Schmidt-Cassegrain, light enters through a thin aspheric Schmidt correcting lens, then strikes the spherical primary mirror and is reflected back up the tube to be intercepted by a small secondary mirror. The mirror then reflects the light out an opening in the rear of the instrument where the image is formed at the eyepiece. The Maksutov-Cassegrain telescope design has basically the same advantages and disadvantages as the Schmidt. It uses a thick meniscus-correcting lens with a strong curvature and a secondary mirror that is usually an aluminized spot on the corrector. The Maksutov secondary mirror is typically smaller than the Schmidt’s giving it slightly better resolution for planetary observing. However, the Maksutov is heavier than the Schmidt and because of the thick correcting lens, it takes a long time to reach thermal stability at night in larger apertures. The Maksutov optical design typically is easier to make but requires more material for the corrector lens than the Schmidt Cassegrain. Radio telescopes are directional radio antennas used for radio astronomy. The dishes are sometimes constructed of a conductive wire mesh whose openings are smaller than the wavelength being observed. Multi-element Radio telescopes are constructed from pairs or larger groups of these dishes to synthesize large ‘virtual’ apertures that are similar in size to the separation between the telescopes; this process is known as aperture synthesis. As of 2005, the current record array size is many times the width of the Earth—utilizing space-based Very Long Baseline Interferometry (VLBI) telescopes such as the Japanese HALCA (Highly Advanced Laboratory for Communications and Astronomy) VSOP (VLBI Space Observatory Program) satellite. Aperture synthesis is now also being applied to optical telescopes using optical interferometers (arrays of optical telescopes) and aperture masking interferometry at single reflecting telescopes. 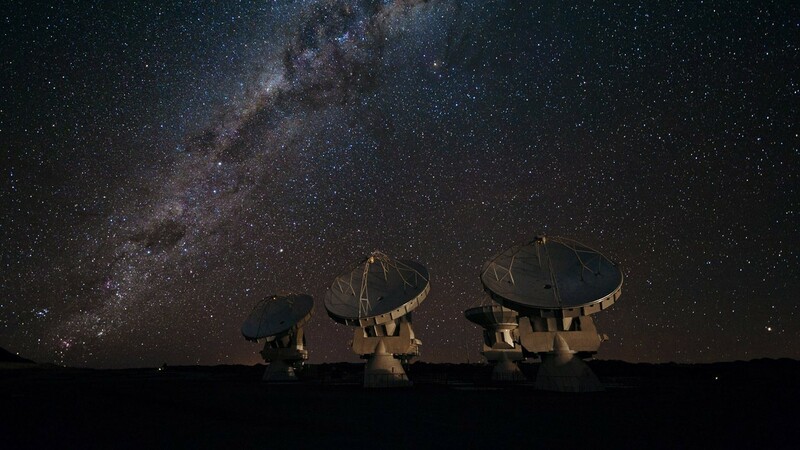 Radio telescopes are also used to collect microwave radiation, which is used to collect radiation when any visible light is obstructed or faint, such as from quasars. Some radio telescopes are used by programs such as SETI and the Arecibo Observatory to search for extraterrestrial life. X-ray telescopes can use X-ray optics, such as a Wolter telescopes composed of ring-shaped ‘glancing’ mirrors made of heavy metals that are able to reflect the rays just a few degrees. The mirrors are usually a section of a rotated parabola and a hyperbola, or ellipse. In 1952, Hans Wolter outlined 3 ways a telescope could be built using only this kind of mirror. Examples of an observatory using this type of telescope are the Einstein Observatory, ROSAT, and the Chandra X-Ray Observatory. By 2010, Wolter focusing X-ray telescopes are possible up to 79 keV. Higher energy X-ray and Gamma-ray telescopes refrain from focusing completely and use coded aperture masks: the patterns of the shadow the mask creates can be reconstructed to form an image. X-ray and Gamma-ray telescopes are usually on Earth-orbiting satellites or high-flying balloons since the Earth’s atmosphere is opaque to this part of the electromagnetic spectrum. However, high energy X-rays and gamma-rays do not form an image in the same way as telescopes at visible wavelengths. An example of this type of telescope is the Fermi Gamma-ray Space Telescope. The detection of very high energy gamma rays, with shorter wavelength and higher frequency than regular gamma rays, requires further specialization. An example of this type of observatory is VERITAS. Very high energy gamma-rays are still photons, like visible light, whereas cosmic rays includes particles like electrons, protons, and heavier nuclei. A discovery in 2012 may allow focusing gamma-ray telescopes. At photon energies greater than 700 keV, the index of refraction starts to increase again. High-energy astronomy requires specialized telescopes to make observations since most of these particles go through most metals and glasses. In other types of high energy particle telescopes there is no image-forming optical system. Cosmic-ray telescopes usually consist of an array of different detector types spread out over a large area. A Neutrino telescope consists of a large mass of water or ice, surrounded by an array of sensitive light detectors known as photomultiplier tubes. Energetic neutral atom observatories like Interstellar Boundary Explorer detect particles traveling at certain energies. -Gravitational-wave detector, the equivalent of a gravitational wave telescope, used for gravitational-wave astronomy. -Neutrino detector, the equivalent of a neutrino telescope, used for neutrino astronomy.